Logan tells Kitty Pryde that Ogun was his sensei, “Man taught me everything I know.” He also relates a story that suggests Ogun met and was the equal of Miyamoto Musashi, the legendary 17th century samurai, raising the possibility of Ogun’s immortality. 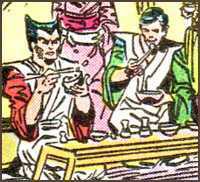 Logan remembers Ogun teaching him about the samurai arts, ideograms and Sun Tzu. Logan recalls meditating with Ogun one night in Kanazawa shortly after becoming his pupil. A large group of ninjas descend upon them, led by a Japanese crimelord, Lord Ugama Hana, who accuses Ogun of committing an ancient wrong that demands satisfaction. As it is a blood feud, Logan is ordered to stand down. Ogun quickly slaughters the legion of ninjas, and then turns to Lord Hana. The two battle evenly for what seems an eternity, until Ogun finally drops his sword and is impaled by Lord Hana. Ogun laughs, removes the sword from his midsection, and slays Lord Hana. That evening, Ogun boasts to Logan that he has learned how to beat death. In a near-death experience, Logan remembers his desire for a family environment when he trained with Ogun. During an inner monologue, Logan reminds himself, “I’m a born fighter. I learned from the very best.” This is probably a reference to his training with Ogun, but since this is a cross-company venture (Marvel-Top Cow), we cannot confirm this story took place. When Logan first arrives in Jasmine Falls after World War II, he tells the leader Bando Suboro that he is seeking redemption and that it was Ogun who told him to seek out Bando when he was ready. That Bando knows Logan’s name and welcomes him to a village of former ninjas trying to learn a better way suggests that Bando was acquainted with Ogun and knew of his one-time pupil, Logan. Through mystical workings, Ogun trains Kitty Pryde as an expert ninja in only one week’s time by recreating her existence on a mystical plane. Later as Ogun gazes at an old photograph of himself and Logan together, he comments that he had had the same plans for Logan. In Origins, doesn’t Logan go to Jasmine Falls after he breaks free from his Team X brainwashing ? That’s what was originally implied. However later issues state that it was before the second World war (despite the appearance of Bucky, but please don’t get me started on that). It would fit with the established Chronology better in 1950’s/very early 70’s, but…that’s the current writers/plotters. Is it possible that he went to Jasmine Falls twice in his life time? Maybe when he got his memory back, he decided to return permanently . Then that’s why they killed his wife and took his son. As punishment and as a replacement for the disobedience of the father. all things are possible (especially at the moment). What does “Ogun” Mean anyway? ive always wondered where they got that name from… sort of like how frank miller got “Agat” for the demon in Ronin as well..